On April 4, 2019 the US-led imperialist military pact, the North Atlantic Treaty Organization (NATO), will mark its 70th anniversary at its annual summit meeting in Washington, DC. 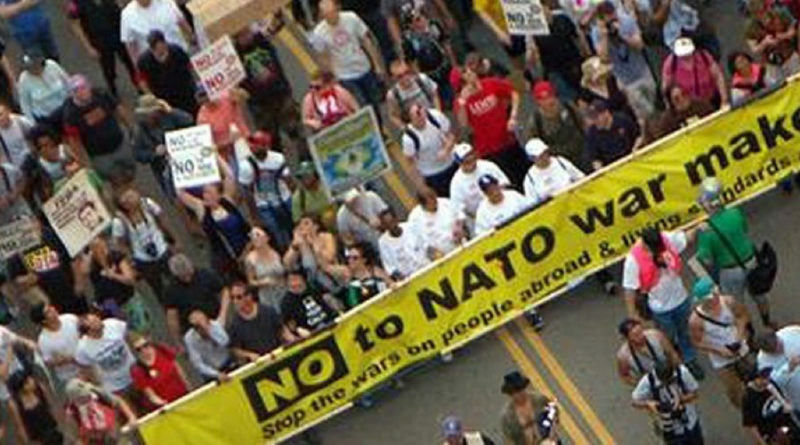 A coalition of organizations are holding various activities to protest NATO between March 30-April 4 in Washington, including a march on March 30 in Lafayette Park across from the White House, a counter-summit to promote peace, and concerts to celebrate peace. Such protests and actions have become a regular occurrence on NATO anniversaries. Observers note that anti-NATO actions on April 4 will coincide with the death anniversary of Dr. Martin Luther King Jr., a man who consistently fought against militarism throughout his life. Canada joined the United States as founding members of this military alliance which now involves 29 member states in North America and Europe and numerous regional partners in Latin America, Asia, and Oceania. As the armed wing of US-led imperialism, NATO has been one of the world’s most deadly forces since its inception. NATO-led wars, more often than not under the disguise of “humanitarian imperialism”, have caused hundreds of thousands of deaths in countries including the former Yugoslavia, Afghanistan, and Iraq. Millions more refugees have been forced to escape the carnage of these wars, while NATO member states have enacted xenophobic laws and policies that make it hard for those very same refugees to seek shelter in those countries. In Libya, NATO bombings turned what was once one of Africa’s richest countries into a chaotic society with open-air slave markets. NATO continues to prop up fascist governments across Eastern Europe, including in Poland and Ukraine, as part of its policy to try to surround and intimidate Russia. Around the world, NATO states maintain an intricate network of military bases and military installations which cause environmental damage and social disruption. To support its insatiable hunger for militarism, NATO continues to demand greater military budgets from each of its member states, leaving much-needed social services for working people chronically underfunded. Under the Trudeau government, Canada’s active participation in NATO is growing, with larger deployment of personnel and materials including arms, and more engagement in exercises and contributions to interventions in Syria, Eastern Europe, and elsewhere. ILPS in Canada sends our warmest greetings of solidarity to the participants of rallies and pro-peace events in Washington. A Canadian contingent will be present. A strong movement to oppose the devastating effects of NATO is crucial as militarism continues to build up around the world. ILPS in Canada is also involved with organizing actions across Canada, and we encourage everyone opposed to war and who stands for just peace to participate in these actions. Saturday March 30, Seaforth Peace Park at 12pm. For additional events in other cities, consult the Canadian Peace Congress’ event listing at https://www.facebook.com/CanadianPeaceCongress/photos/a.197133487099516/1696751157137734/?type=3&theater. ← Free Prof. GN Saibaba NOW!